In 1945, photographer Irving Haberman captured this image of famous actress and singer Marlene Dietrich kissing a GI after he arrived home in New York. 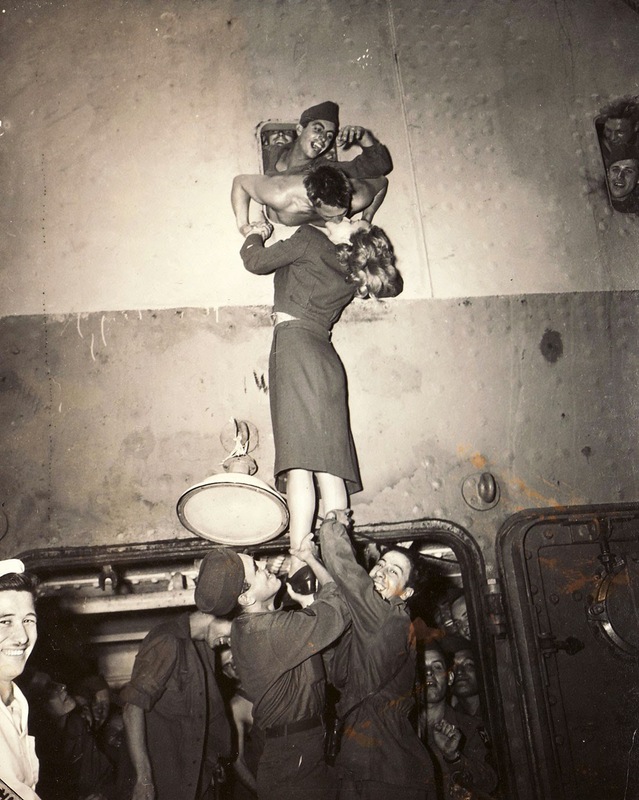 The photo was published in Life with the caption: “While soldiers hold her up by her famous legs, Marlene Dietrich is kissed by a home-coming GI.” Though seemingly all of the men in this picture are enjoying the scene equally, it at first appears strange that an actress would be kissing a random GI on a ship that just returned from war. The ship, Monticello, a converted cruise liner, had originally been built in Trieste, Italy in 1927 and named SS Conte Grande. The US “acquired” the ship during WWII to be used as an American troopship in 1942. Haberman’s photo shows Monticello bringing the 2nd Infantry Division back to New York on July 20, 1945. The soldiers had entered WWII in Normandy on D-Day, fighting across Europe and into Czechoslovakia. After their stop in New York, they were headed to Camp Swift in Texas to be trained to invade Japan. So why was Dietrich there? Dietrich had originally been an actress and singer in Germany before moving to Hollywood to jumpstart her fame. However, she was also very politically opinionated and outspoken. Representatives of the Nazi Party had approached Dietrich in the hopes that she would return to Germany to perform, but she “turned them down flat,” expressing her strong distaste for the Nazi Party. She worked with Billy Wilder in the late 1930s to create a fund to assist Jews and dissidents in their escape from Germany, and in 1937 she put her entire salary from Knight Without Armor ($450,000) into escrow to help refugees. Two years later, Dietrich became a US citizen, and when the US entered WWII in 1941, she was one of the first celebrities to start raising war bonds. Dietrich’s acts “included songs from her films, performances on her musical saw (a skill she had originally acquired for stage appearances in Berlin in the 1920s), and a pretend ‘mindreading’ act. Dietrich would inform the audience that she could read minds and ask them to concentrate on whatever came into their minds. Then she would walk over to a soldier and earnestly tell him, ‘Oh, think of something else. I can’t possibly talk about that! '” Apparently, church papers back in America didn’t particularly appreciate that aspect of Dietrich’s act, and they published many stories complaining about her. When the war ended, Dietrich was able to find her sister Elisabeth, brother-in-law, and nephew, who had been in Belsen, Germany during the war. They had been (begrudgingly) operating a theater used by Nazi officers and officials who managed the Bergen-Belsen concentration camp. Dietrich defended the honor of her sister and brother-in-law to protect them from any prosecution as Nazi collaborators. Dietrich was also awarded the Légion d’honneur by the French government to recognize her efforts during the war (because France was super helpful in the war too…) and the Medal of Freedom by the US in 1945, which is the highest American civilian medal. She stated that this was her proudest accomplishment. I’m with Jonathan on this one. How have we not heard of her?! What she did sounds amazing. I mean, she stuck it to the Germans! It has to be nerve racking being on the front lines like that during the biggest conflict in the history of the world, but imagine the bravery! Wow, I don’t know what exactly the Nazis did to tick her off, but I’m sure they regret it now. You go girl! Wow she actually sounds like an amazing person. It doesn’t take a lot to hate Nazis but to dedicate yourself that much to stopping them as a civilian is inspiring. That dedication would have truly been shown if she had been allowed to be in battle. But that’s really interesting! Cool Post!